This is a wonderful hike with a trail that was very well thought out. 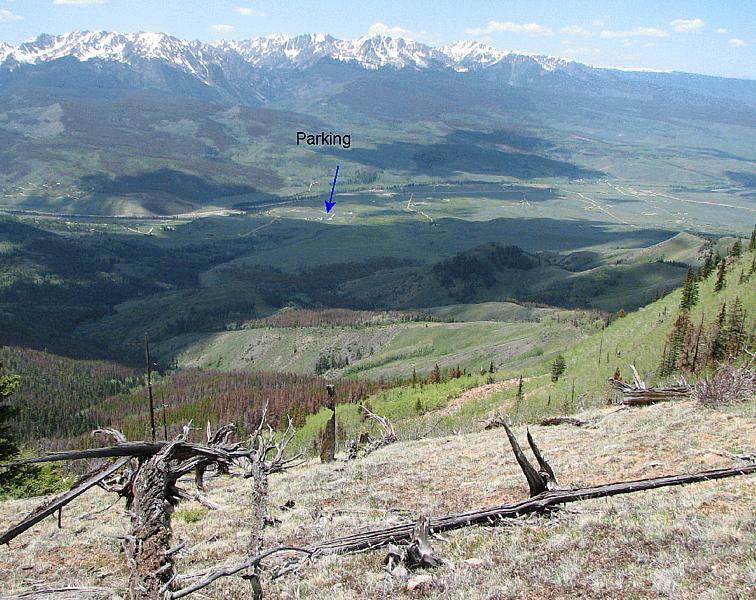 There are stunning views of the Gore Range to the West through most of the trail. Low down the trail is in a valley and weaves in and out of meadows to give you these stunning views. Higher up, but still below the top, the trail is on a ridge which again gives stunning views. The trail was empty as well, we only saw one other group. They were young and much faster, both up and down :) . If going all the way to the top, hiking poles are a must. The profile above is from the National Geographic software reading the topo maps. Using the Garmin Software, one can get a profile based on the Garmin unit recording the elevation. It can be seen here. This is from the gps readings when it has enough satellites for 3D. The gps is somewhat noisy on reading elevations and has over a 100 foot uncertainty. Before going on this hike, Marina found a page from the Dillon Ranger district that also uses the National Geographic mapping software. A link to it is here. If you go to this page you will see that at the top my track is much different than their track. I had two gps units on me and had them on both up and down, essentially giving me four tracks which all overlaid each other at this magnification. I have 100% confidence mine is correct. At the time of this writing, I have lost both copies of my Summit Hiker. But what I remember from it is that Mary Ellen says the trail is hard to follow. By the time we did this hike, the trail was not only well "signed" but also well trodden. We had no problems finding it and following it. 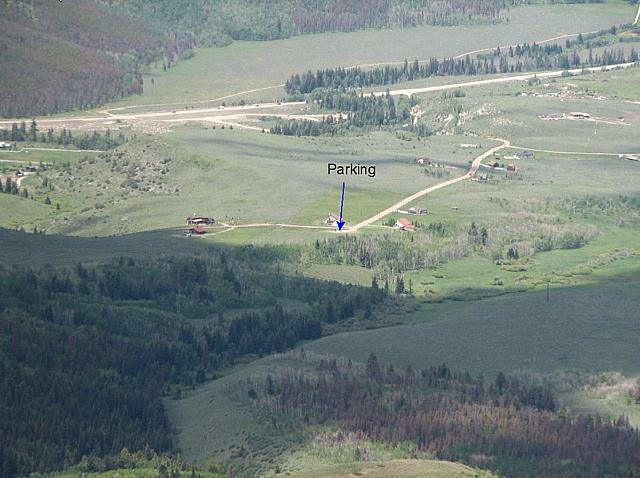 To get to the trailhead from Silverthorne, head north on Colorado 9, the Forest Service says 10.6 miles from I-70. When the road goes over the Blue River, leaving the Blue on your left (West), take the next right which will be FSR2400. At this point, look for signs that have a brown background and say "Acorn Creek". This will lead you to the parking lot, shown here in the "cross-hairs". Once you have parked, walk south to the fence and sign in board. The trail starts here. There is a cattle gate which was propped open by a rock. The Forest Service Sheet assumed it was closed and asks that you close it. I would say if it is open and looks like it has been that way for some time (as it was the day we hiked) leave it open. If it is closed then close it. Using National Geographic elevation numbers, you are at 8647 feet. There is a slight descent to reach the creek, so you will be paying for this real estate when you come back out with a slight climb. After crossing the creek, the climb begins. At 1.76 miles and 9559 feet above sea level (1 hour, 12 minutes by slow hike), you cross into the Eagles Nest Wilderness. This happens in trees. On the way down, I noticed that this area was rich in Columbines, which were not yet out. I may go back and hike only to here when the flowers are out. While the profiles don't really show it, I feel that the steepness of the climb increases at this point until you reach the top. At this point by going to the left, you climb on a compound slope out of the valley. 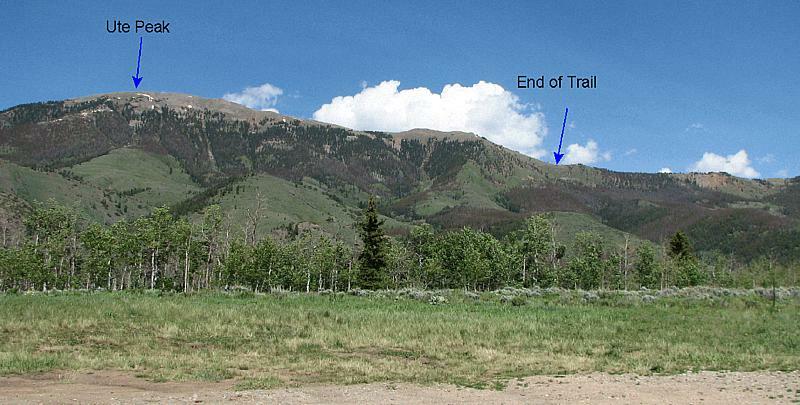 With the exception of one ridge, the rest of the hike is on compound slopes. There is a spring near by (at least there was this day) making this an excellent campground, and a quick look shows it has been used as such. The trail continues up mostly on a compound slope, and it starts to get looser with footing becoming a bit more treacherous. At about 3.22 miles (10898 feet), another hairpin turn and the trail becomes very steep and loose, at one point having to cross over a washout. Hiking poles in this region are a must. I made it up without them, but borrowed one of Marina's in this area on the way down. On the way up, I had my uphill hand on the ground the whole way. Finally at 3.49 miles / 11,319 feet and a slow 3 hours 45minutes we made it to the top, which of course is not a peak, but rather just a saddle where the Acorn Creek Trail ends and joins the Ute Peak Trail. As you can see, there were snow drifts at this time of year. We stopped for a while up there, and had lunch. We made it back down much faster than the trip up, only 2 hours 15 minutes.